This is very strange. 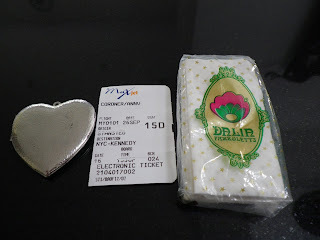 Before travelling to New York with my friend Jean we stayed overnight at a hotel. When we left I was double checking that we hadn't left anything behind and that everything was in the right bag, passport, purse and the like. I was travelling with an empty rucksack because I always "acquire" stuff when I walk through an airport, like a newspaper, another book, some extra strong mints etc. So...I checked my rucksack to make sure I didn't have anything in there that could go into my hold luggage and pulled out these three items. The locket I had never seen before, the boarding pass was for the last flight I had taken to New York with Davy to meet up with Jack & Betsy, the very same friends I was going to visit now , stopping off first in New York before flying on to Seattle where they live and the tissues I had bought when we were with them in Italy, their last visit to Europe. I have used this rucksack many, many times and never seen these items in it before. But the real mad thing is that my friend Jean used to have a business called Silver Locket. I don't believe in "signs" and that sort of weirdness, but this made the hairs on the back of neck stand on end. Make of it what you will. Very interesting! How did it make you feel? Occasionally, I come across something totally unexpected that I had misplaced and didn't even remember, often something really special and it always gives me such joy! For years, I've been looking for the professional pictures I had taken at the Taj Mahal in 1997. I don't have a clue where I put them. I keep praying that, someday, they turn up! It made me feel that Davy was still looking after me. I know that is completely insane but if you could see the locket you would understand how I would not have forgotten I had it! It's big and battered, much like me! . Hmmm, sometimes strange things do happen and there's no obvious way to explain them. It's lovely that you took comfort from this funny experience. Even weirder, as Gone Back South pointed out to me, is that we are both in similar positions (having just lost our husbands within months of one another)and wrote similar posts within four minutes of one another. It is strange how we can overlook things in a bag only to notice them later. It often happens to me that I will search for something only to find them where I had checked several times before.